Help Sbarros celebrate on National Breadstick Day by picking up 2 free beadsticks! These days, we have holidays for everything. Did you know that October 25th serves as National Breakstick Day? Maybe you would like some delicious breadsticks this October 25th? Why not celebrate National Breadstick Day at Sbarros? 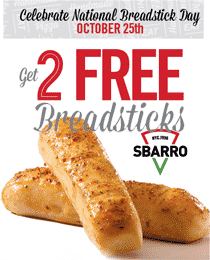 You can grab two free breadsticks from Sbarro this October 25th. Simply click through the link to request your free deal. This deal is only available at participating Sbarro restaurants around the country. What a yummy pick-me-up for everyone this week.